Making your own household cleaners can save you money as well as save the environment if you take few minutes and work on the cleaning solutions yourself. As promised in our previous article, titled “Green Cleaning tips – Making sustainable living easier” we will be discussing some methods of making your own cleaning solutions from all natural, non toxic ingredients that are available at home or in the local supermarkets. You can make your own cleaning solutions that work just as well as the chemical based commercial cleaning solutions available in the market which are toxic and harmful for your skin, health, and environment. The methods described below are easy to follow and gets the job done. Here is a good all purpose cleaner that works on any surface. 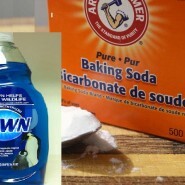 This solution cleans and disinfects your counter tops, floors, etc. and works just as good as any other “all-purpose cleaners” you would find in the market. The best part is you can make it yourself! Take a funnel and attach it with your spray bottle. Add 2 table spoons of borax and 1 table spoon of washing soda (not baking soda) into the funnel. Wash them down with ½ cup of white vinegar. It will start to foam. Wait till the foam has gone down. Add ½ table spoon of dish washing detergent. Finally complete the solution by adding 2 cups of hot water into it and shaking it well. If you have spots on your fabrics that will not come off with regular detergent, you may use a solution made from baking soda, hydrogen peroxide, and dish soap. This solution will effectively remove food stains, grease stains, etc. This solutions is cheaper than any commercial stain remover you will find at the super market and completely safe for the environment. Mix one part dish washing liquid with two parts of hydrogen peroxide in a small bowl. Add 1-2 table spoons of baking soda and mix it nicely. Apply on the stained part of your cloth with a toothbrush and let it sit for a while. Rinse and wash your cloths as usual. Make sure that the solution is safe for your fabric by applying a small amount to test the solution first. Spring is in full swing and you might as well start spring cleaning for your house. After the winter storms, your windows must have gathered dust and needs cleaning. The glass cleaner described here can be used on any surface that you want sparkling clean including your automobile windows. This cleaner works just as well as any commercial glass cleaners and a lot cheaper when you make it yourself. You will love the results! Get an empty spray bottle and add ¼ cup of rubbing alcohol and white vinegar into it with a funnel. Pour in a table spoon of cornstarch, and 2 cups of warm water to wash it down. Shake the solutions gently and you are done. You can get a box of wash cloths from your local dollars stores which work great for washing windows and wiping them to get the best shine. Newspapers work great for wiping down your car windshields. I hope you found these homemade recipes to be helpful in your spring cleaning and don’t forget to share!